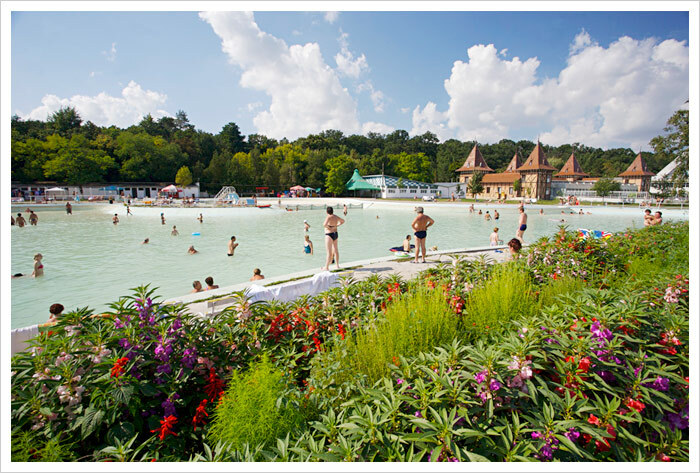 Established in the 18th century, Baile Felix is currently Romania's largest health resort, open year-round. The thermal waters found here, very rich in oligominerals, are supplemented by sapropelic mud. This natural combination has proven helpful in easing the effects of rheumatism and some paralysis, as well as gynecological afflictions and nervous disorders. Oradea, eight miles east of the Hungarian border, is one of the most picturesque towns in western Romania, as well as an important cultural center with a state theater, puppet theater, philharmonic orchestra, libraries, and museums. At the turn of the last century, most of the town's old houses were rebuilt and customized in the then-trendy architectural style from Vienna called "Secession," featuring richly decorated facades of pale pink, blue, green and white. There are around 100 religious sites of different denominations in Oradea, including three synagogues, the biggest Baptist church in Eastern Europe and Biserica cu Luna, a church with an astronomical clock depicting the phases of the moon. Other sites worth visiting are the Cris Ethnographic Museum, a museum housed in a large baroque palace with 365 windows, and Cetatea Oradea, a pentagonal fortress. Straddling the Mures River and occupying parts of both Crisana and Banat provinces, Arad traces its history back to the 12th century. Churches and cathedrals cover four centuries, several denominations, and architectural styles ranging from baroque to neoclassic. The exciting architecture of the buildings in the city's square reflects the influence of the one-time Austrian-Hungarian occupation; most notable are the City Hall and Cenad Palace. Other sites of note include a fortress originally built by the Turks in 1550 (and rebuilt twice in the 17th and 18th centuries), the Palace of Culture and State Philharmonic House. The Bihor Mountains, descending from east to west, hold some of the best-hidden treasures of Romania. Explore their cave tunnels, underground waterfalls, lakes hidden from the daylight, silent forests, mysterious intermittent springs, canyons and glaciers. Caving or spelunking fans should check out the region's caves, including Chiscau — also known as "Bear's Cave" — west of the Bihor Mountains. Named after the fossil traces of the cave bear species (extinct 15,000 years ago) discovered here, it also has stalactites and stalagmites in unusual shapes, some resembling animals and castles. Guided tours of Bear's Cave are available. Daily train connections from/to a number of Romanian cities, including Bucharest, Arad, Brasov, Cluj Napoca, Satu Mare, Sighisoara, Suceava. From Oradea, continue by bus to Baile Felix. The site has complete information about domestic train schedules and fares. Note: For departures from/to Bucharest, please select Bucuresti Nord.